Basan ladoo is very well known sweet dish in India and this dish is liked by persons of all age group. This dish is, unanimously, known as basan ladoo all over the country. 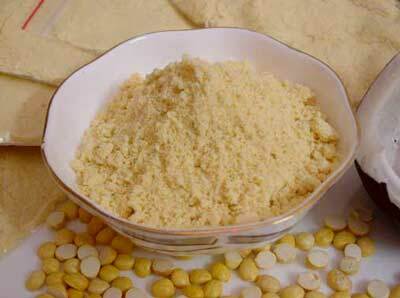 Basically,this dish is made from basan(gram flour/chickpeas gram flour), sugar and lots of ghee (clarified butter). My son likes besan ladoo very much, he is health as well as weight conscious. He asked me whether basan ladoos can be prepared using less ghee so that he can consume more ladoos. I tried these low fat besan ladoos for my son, they came out so delicious and tasty that my son loved it. I am using very less quantity of ghee/clarified butter. You will be happy to know that, I am going to tell you the very easy method of preparing besan lodoo with less ghee. You will love to prepare this dish again and again. Let’s see the preparation of delicious, low fat besan ladoo. I am using only raisins, you can add any dry fruits of your choice and taste. Place a saucepan on medium heat, pour sugar and 1 cup water to it. Stir it continuously untill sugar dissolves completely. Take out from heat and close it with lid and keep it aside. Place a wide bottemed frying pan on medium heat, pour ghee in it. After 1 or 2 minutes, lower the heat and add cleaned basan (gram flour) to it.Roast it until it starts leaving an aroma and turns to golden brown colour. It may take 15 – 20 minutes. Add milk powder and raisins to it and mix it well. Add sugar syrup to it and mix it well and remove from heat. I am using, here, a small quantity of milk powder, which gives a beautiful texture and taste to ladoos. You will have to start making ladoos immediately, wet your palm, every time, before taking the stuff in your hand, otherwise your hand will burn. Initially, the stuff looks like dry and hard, but need not worry. Loosen small portion of the stuff with hands and sprinkle few drops (say 1/4 tea spoon) of milk over it and mix it with fingers. By doing this, stuff will be soft and smooth to make ladoos. Take a little quantity of mixture in hand, clump hands with mixture to tighten it. Slowly using inner palm, rotate it with another hand to make small balls. Tasty and healthy low fat Besan ladoo is ready to eat. You can store it in a bottle more than 1 month. Isn’t it simple and less time consuming. You will love to prepare this again and again if you try it once. I love these. They are usually so high in fat so I was pleased to see your recipe, which I will try tomorrow. Thanks! Glad to know that you liked my recipe. Delicious food does not have to be high in fat. So I like to experiment with recipes to make sure it’s low in fat and tasty at the same time.